The novel is the “official Baedeker of the soul,” the Hungarian writer and literary historian Antal Szerb remarked in 1936. * Or should we say it is its Lonely Planet guide? Novels – and other artworks – have the power to take us to corners of the human psyche where we would be afraid to venture on our own. They also show us that these dark and scary places are in fact not so far from places we visit every day: our fears and freak outs lurk beneath the most mundane facets of our existence, disguised as rational responses to human interaction. Longing to welcome other people to our lonely planet, we are at the same time terrified of them getting a glimpse of what we do not want to show. For this reason, we play games. Innocent games designed to obscure the way to our souls. Manipulative games that provide us with the illusion of being in control. Keeping distance within the greatest intimacy gives us a certain kind of comfort – so those distances have to be travelled cautiously. Besides setting up fingerposts on these journeys, art reminds us that our frivolous games can sometimes turn serious – which is why we need our trusted Baedekers in our hands. The figure of a girl who played with her lover “as the cat trifles with the mouse” became iconic in 19th-century Hungarian culture. 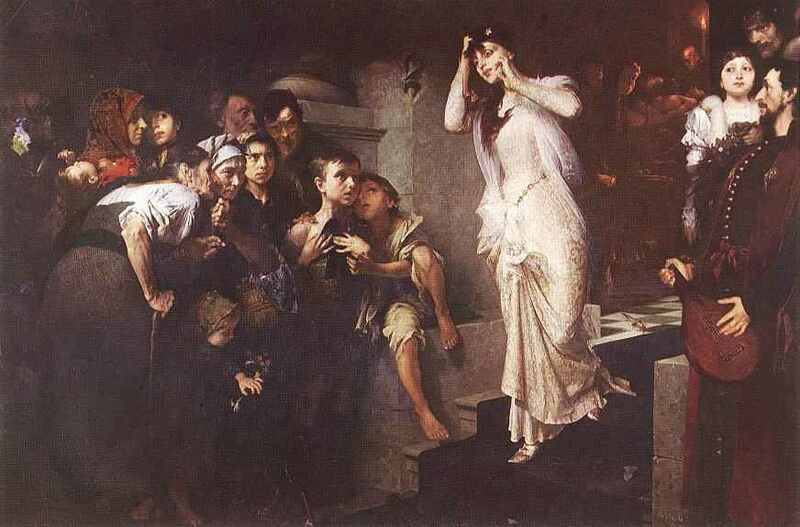 Abigail Kund is the tragic heroine of János Arany’s 1877 ballad Call to the Ordeal (Tetemre hívás). ** As I will soon explain in detail, Abigail did something we all do to each other every day with less tragic consequences: while playing her game, she touched on a nerve; she pushed a button that released her lover’s fears and insecurities. I have to say, however, that the idea for this post came to me after reading a present-day American bestseller, Gone Girl by Gillian Flynn. That novel – maybe the scariest Baedeker ever – tells the story of a couple who know each other the best in the world and yet do not know each other at all. It exaggerates those innocent games into a murder mystery. Getting closer to another person is a thrilling but all in all scary experience, and this book catalogues and entangles all the strategies people use to cope with it. We try to fit the other person into a mould we have created for them – because it is so much easier to find our way among preexisting stereotypes than among the many spurious traits of a real, individual personality. (This is how the painter Bertalan Székely tried to preconceive his marriage in neat little pictures presented to his wife-to-be.) We get annoyed – and insecure – if the other person does not comply. We expect them to know us inside out and to read our minds, but feel threatened if we find that they do. We imagine relationships in terms of power relations and believe that showing our feelings for the other person makes us weak and vulnerable – it means conceding control to them. Games help us retain control – at least that is how Abigail saw it.